Share the post "Cute Plant Mimulus Pictus Or Calico Monkeyflower"
Mimulus pictus is a species of Monkeyflower known by the common name Calico Monkeyflower. Mimulus are called monkey-flowers because some species have flowers shaped like a monkey’s face. The generic name, Latin mimus meaning “mimic actor”, from the Greek mimos meaning “imitator” also references this. It grows in broadleafed upland forest and cismontane woodland habitat, in open, bare, rocky, granitic, and often disturbed areas. Mimulus pictus is a bit of an exception among the Mimulus variants: it is a small plant with short hairy and rectangular in cross-section stems and very tiny, yet eye-catching flowers. It is almost as if the dark red markings are painted onto the cream white base with a very fine brush: the tubular base of the flower is encapsulated in a dark reddish calyx of sepals with uneven lobes. The five-lobed flower has a maroon throat and the circular face is white with stark maroon veining. Out of all Mimulus, Mimulus pictus and M. gemmiparus appear to be relatively isolated genetically. Both taxa possess morphological and ecological attributes not found in any other Mimulus species. Family: Phrymaceae. The genus had traditionally been placed in Scrophulariaceae (Figwort Family). Native: Central California, from the southernmost Sierra Nevada and adjacent Tehachapi Mountains in Tulare and Kern Counties. Uses: Border plant. Decorative. In pots. Tips: Cut heads if you do not want volunteer seedlings next season. Do you grow Mimulus Pictus (Calico Monkeyflower) in your garden? What is your experience with this plant? Please share with other fellow gardeners in the comments below! 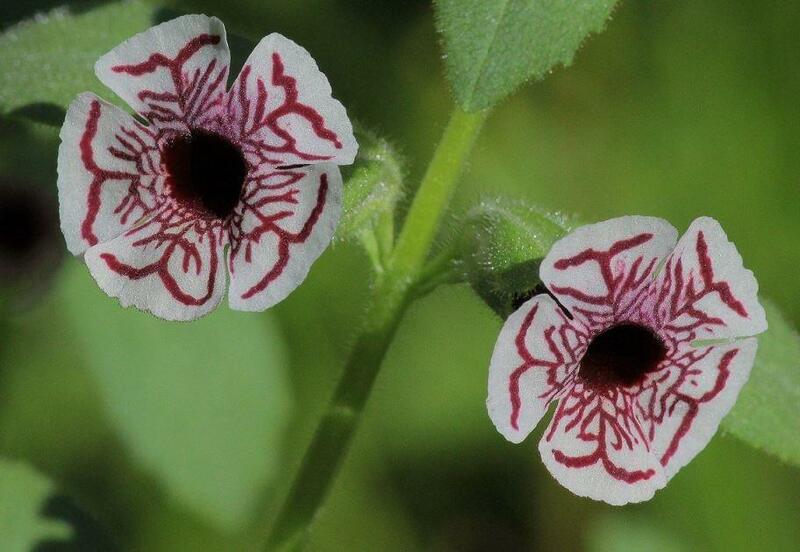 Do you sell Mimulus Pictus (Calico Monkeyflower) seeds or have plants for sale? You can place your advertisement here. Contact us now!